Merry Christmas! Feeling beyond blessed to spend this time with family. Wishing you and yours an abundance of blessings, love, peace, and joy. Merry Christmas! I love the lights in these photographs! And you look stunning! Merry Christmas gorgeous! Love those tights! Look how cute your tights are!! Love it. Merry Christmas!! You look beautiful! Happy holidays. Looking fab in your Christmas outfit. I was wondering what camera and lens you're using on these pictures? Lovely! Pretty photo! Love the effects you did! You're going to have to give us another photo tutorial! Beautiful dress! What a great color on you! Beautiful pictures! Merry Christmas! You look darling! Love the red bow in your hair :) Perfect touch! stop being so beautiful - you are making the rest of us look bad! ok but seriously - stunning. you look stunning! i just love how your bangs frame your face!!! emerald is your color girl! Perfect Christmas look, hope yours was wonderful! You look gorgeous, I love the stockings with this skater dress. Your hair is so 60's chic and playful! Love it! You look fabulous. So festive! I love this whole look. You look perfectly festive! Happy holidays pretty girl. That dress is so pretty! And I love the polka dot tights with it! Have a Happy New Year's! I love the dress on you. Looking beautiful! This is such a cute & classic look for the Holidays! I love the red bow in your hair! Wow! You look incredible! 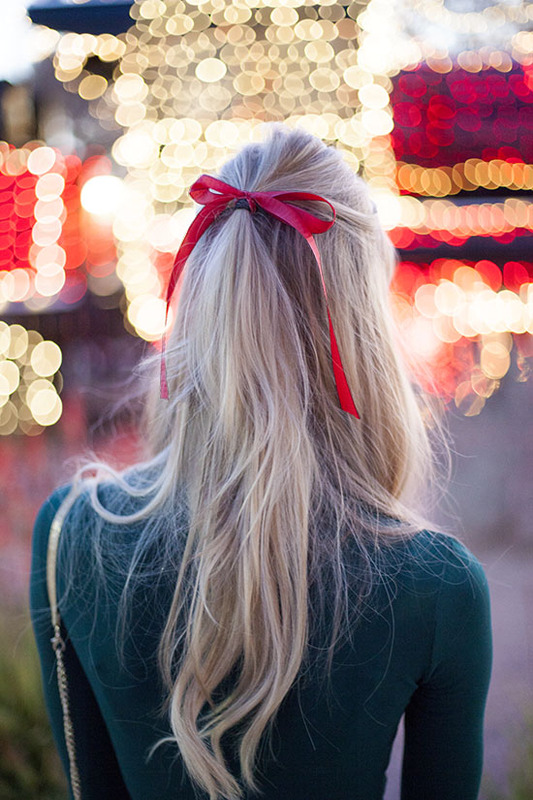 The tights and the red bow in your hair are such perfect details! You look gorgeous! I love your nails! Merry Christmas to you and your loved ones! Thank you for a phenomenal blog. I don't always comment, but I visit ALL.THE.TIME and I LOVE IT!! Happy New Year! If you get a sec, checkout my latest post 'Ostrich feather shirt: from day to night'. Adorable. Love that color on you! I've been reading your blog for a while and I thought I was already following you...silly me. Love your blog & your style! You look just gorgeous! I love the look! what a festive outfit! love the added red bow touch! LOVE your red bow!!! The perfect touch!!! Wow! You are looking so gorgeous in all the images thank you very much for the sharing. If you get a sec, check out my latest post...'Seaside Blue'. Gorgeous Looking with black dress. Awesome photos and great capture. Thanks for sharing.